Over the last couple of blogs I’ve written about preventing fire and flooding in rental property. Now I’m doing a short series on spotting problems when buying. Most property investors and even some developers are so focussed on the ‘business’ side of ‘property business’ they can be surprisingly ignorant about the ‘property’ side – what it is they are actually buying – the building itself. An equivalent is a car dealer who knows nothing about the engineering or mechanics of a car. It’s perfectly possible to run a car business this way, but leaves you at the mercy of professional mechanics and assessors. In the same way, not knowing about the building leaves you at the mercy of builders and surveyors. A caveat here – a little knowledge is a dangerous thing, many of my most difficult clients are keen DIYers who look over my shoulder and question every move. Yes you will be empowered to recognise and prevent bad practice when it happens. But if you find a good builder, trust him to know what he is doing and don’t attempt micro-management. The easiest clients either know next-to-nothing and assume I’m competent, or are property professionals who see I’m competent and leave me to it. I’ll start at the top of the building and work down. Roofs come in many forms, of which traditional pitched roofs are commonest and most reliable. Generally, the fewer things projecting through the roof, the better. Anything like a chimney or party wall that goes through the roof, essentially makes a great big hole, and we all know that holes in roofs aren’t a good idea. Other projections are dormer windows, Velux windows, parapet walls, and even other sections of roof, for instance where a gable-end joins a main-roof at 90 degrees. These form valleys at their intersections, usually lined with lead. Unfortunately lead corrodes with oxidation and acid-rain, causing leaks. In an ideal world we’d all view loft spaces in heavy rain, revealing any drips. When it’s dry check for suspicious grey vertical streaking caused by water running down the chimney in the loft, indicating leaking leadwork. Also look for yellow stains on the ceiling near chimneys or other projections through the roof. Staining can also be caused by leaking plumbing in the loft or an overflowing water tank. The best pitched roof for a terrace of houses is a single roof over the lot, in line with the terrace. 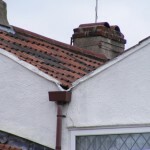 Unfortunately, in some towns such as Bristol where I live, we are cursed with many ‘gulley roofs’. In these, in an apparent attempt to save timber, multiple short roofs were built across the line of a terrace, one over each house, with a lead gulley between. These always give trouble, and need expensively re-lining with GRP or lead. Another form of gulley is where the parapet wall projects up beyond the roof, forming a channel in place of a gutter below roof level. These are also very prone to leaks and becoming blocked with leaves etc. Damp stains on party walls beneath gullies indicate leaks, as do stains on outside walls beneath parapets (although these can also be caused by penetrating damp,condensation, or even devious damp. While you’re in the roof, check the condition of the sarking (underfelt) beneath the tiles/ slates. Old, cracking bituminous felt will need replacement with a modern micro-porous felt, which means taking all the tiles/ slates off first! A big job requiring scaffolding. Also inspect the timbers for excessive bowing under the weight of the roof. Most older houses (pre-building regs) were built with very undersize roof timbers and these can sag quite severely. A certain amount of sagging is not necessarily a problem if the roof is already 100 years old. However, when roofs are re-covered with tiles where there was slate, or re-tiled with modern concrete where there was terra-cotta, excessive deflection is likely. Tiles are much heavier than slate and concrete imitation terracotta tiles are much heavier then the real thing. I always put the original tiles back if I can. They’re usually good for another 100 years, and I think they look better too! The same can’t always be said of slate, which can become soft and flaky with age. Inspecting from the inside where most of the flakiness occurs. A bit of surface deterioration is OK, but if they’re soft most of the way through they need replacement. Galvanised slate nails lose their zinc-coating and become corroded as the slate moves about. Check the outside of the roof. If a few slates are missing or held on with tingles (little strips of lead or copper hooked underneath them) the nails may be on the way out. Also inspect roof timbers in the loft. Is there evidence of rot or woodworm near damp areas? Particularly check around the chimney breast and any other projections, and at the eaves where it’s coldest and condensation accumulates. Live woodworm is indicated by little piles of sawdust around exit holes the beetles make to mate. Woodworm needs moisture and can be eradicated by thoroughly drying out the timber. Borax is a non-toxic-to-humans wood treatment. Next week I’ll talk about other types of roof.